Chungha Comes into Her Own in "Blooming Blue"
Slightly more than a year after her debut as a soloist, Chungha returns stronger than ever with her mini album Blooming Blue, with “Love U” as the title track for the album. 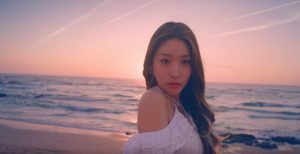 Having successfully established her musical identity with her earlier releases, Chungha builds on this and continues to show off her potential here. Blooming Blue is a light summer album which tells a story about the vibrancy of being in love — from the heart fluttering beginnings of a relationship, filled with uncertainty and excitement, to the infatuation which is intensely felt and ending off hopefully after going through some tension with a solidification of feelings and a determination to shower the other party with a lot of love. The album is not just cohesive lyrically, the tracks complement each other, with just enough diversity to make each track unique. Chungha’s presence shines through this album as she powers through and makes each track sound energetic, full and well developed. Her wide vocal range is apparent in this album, whether it’s in the generally high keys of the songs or the impressive ad-libs she performs, especially in “Cherry Kisses” and “From Now On”. While she did end up giving a pretty shrill delivery at times, there is a definite improvement from January’s “Roller Coaster” as she displays a lot more strength in her voice here, and uses it masterfully to drive the songs. For the most part, vocal effects and harmonies were used well to enhance the song, either for emphasis or to add depth to the track, as in “From Now On”, which is the vocal standout of the album. 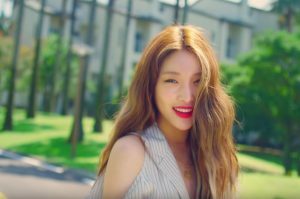 The sultry and noticeably more emotional way Chungha croons the jazzy “From Now On” really expresses the lyrics of the song, which speak of the pleasure a lover brings and an increasing desire to show her love for him. Her voice works well with the bass-heavy instrumentation to slowly creep up on the listener and emphasise the gradual process of finally becoming sure of one’s feelings for another, reaching a climax with the ad-libs and harmonies toward the end of the song, successfully lifting it out of standard ballad territory. “Drive” is another song in which the bass stands out, and the proportion of these bass-heavy songs in this album is an unexpected musical choice, considering how most summer albums are light. Chungha pulls this off because of her high vocal timbre which complements the bass, proving her flexibility and ability to handle different genres. The beat and the vocal technique she uses in “Drive” reminded me a little of “Shut Up” by the Unnies but the song is less dynamic compared to the other tracks in the album, mostly because the repetitive bass riff gets old quickly. The bright side to this is that the slightest change to the melody or instrumentation ends up standing out a lot to listeners and seems very refreshing. Take for instance the pre-chorus leading up to the final chorus, where she slows down and unleashes some powerful belting and plays around a little with the melody. These small embellishments greatly liven up the song and keep it interesting. While most of the tracks here got their build-ups right, “Cherry Kisses” sticks out like a sore thumb. It is probably the most catchy song of the album but is, unfortunately, let down by the premature building up of the beat in the pre-chorus. It comes across as jarring because the build-up sounds too overpowering, and Chungha’s voice does not really build up as rapidly as the beat did. This comes across as more of a mixing issue than anything else, because the way she sings “Babe” in the chorus is astounding (and the rest of the chorus actually), making this song very enjoyable to listen to. Probably the safest of these tracks for Chungha to make her comeback with, “Love U” is a burst of fresh air with its tropical instrumentation, effective beat drops and Chungha’s effortless high notes. The fun choreography which goes with the song makes this a perfect summer bop and is an ideal choice for her to flaunt both her singing and dancing abilities. All in all, Blooming Blue is a very enjoyable listen for the summer, and not just because it is a short mini album. It is a great way for Chungha to explore various genres all while cementing her status as an exceptional female soloist. I cannot wait to watch how she will continue to develop her musical identity from here and rise in the future. A Singaporean student whose life is continually changed by her love for K-pop. Currently in love with Dowoon's drumming and Sungjin's raspy voice.